How much of the new Bay Bridge span is faulty? Eager to get an answer to that question, investigators will scrutinize every single part supplied by Dyson Corp, Bay Bridge spokesman Andrew Gordon told KQED's Tara Siler. The Ohio company made threaded rods (also called bolts) that snapped when tightened last month, and also supplied many other components for the project. But Gordon could not say how many or how crucial are the parts that Dyson supplied. The Toll Bridge Program Oversight Committee "has ordered a thorough review, which includes looking at all possible options for fixing the situation in regard to the bolts that broke, how the shear key that those bolts were supposed to hold down can be secured, thoroughly looking at the other rods that are out there that were provided by Dyson, and looking at any and all other components and pieces that were also provided by Dyson," Gordon said. The list of those parts "is being compiled," he said. According to Caltrans records, the parts manufactured by Dyson that failed quality tests included 1-inch diameter, 17-inch long bolts - also for the shear keys and bearings - and 3.5-inch diameter, 4-foot long anchor rods for the main cable of the suspension span. The problem surfaced last week when Tony Anziano, toll bridge program manager, revealed at a meeting of the Metropolitan Transportation Commission that 32 out of 96 anchor rods holding two shear keys had snapped. 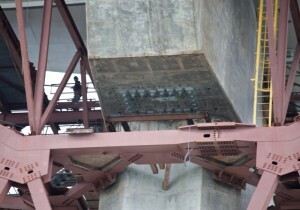 The shear keys are intended to bolster part of the bridge in an earthquake. Gordon did give an accounting of the number of such rods: "There are a total 288 anchor rods, 24 anchor rods for each bearing, four bearings, 48 anchor rods for each shear key. The rods in question are the 96 that were tightened for two shear keys." But he said bridge engineers had not decided yet how to test the rods and other components from Dyson. The rods appear to have broken because they were made of steel contaminated by hydrogen. Caltrans acknowledged Monday that earlier tests performed on some of those galvanized-steel bolts had raised questions about their ability to stretch during an earthquake, but that agency engineers had approved them anyway.